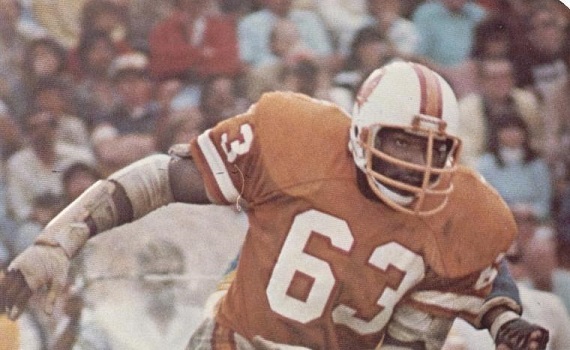 Selmon won the Outland Trophy and Lombardi Award as college football’s best lineman in 1975 and was the first overall draft choice of the expansion Buccaneers for ’76 (his brother Dewey, a linebacker, was picked in the second round). He missed half of his rookie season due to a knee injury but came back strong in 1977 and excelled as a pass rushing right end in a 3-4 alignment despite often being double or triple-teamed by opponents. Another solid year in ’78 was tempered by his undergoing knee surgery afterward. Buccaneers went 10-6 to finish first in the NFC Central – the first winning record in franchise history – while leading the NFL in fewest yards allowed (3949), fewest passing yards allowed (2076), and fewest points allowed (237). Won NFC Divisional playoff over Philadelphia Eagles (24-17). Lost NFC Championship to Los Angeles Rams (9-0). Selmon was chosen to the Pro Bowl again in 1980 and every year thereafter until a back injury ended his career in 1984 – a total of six consecutive selections (he was forced to sit out the 1985 season before formally retiring). He also received 1st or 2nd team All-NFL recognition in 1980, ’82, ’83, and ’84. Sacks were not counted as an official statistic until 1982, so while had 23 in his last three seasons with a high of 11 in 1983, he has unofficially been credited with 78.5 for his career. Selmon’s #63 was retired by the Buccaneers (the first such honor in franchise history) and he was inducted into the Pro Football Hall of Fame, Class of 1995.